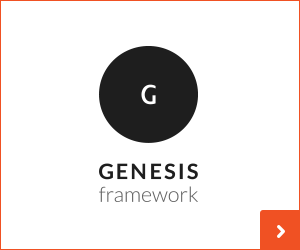 It is similar to the questions of …How do you like your coffee? How do you like your eggs? Are you an extra crispy, crunchy person or do you prefer it a bit chewy, limp, more meaty per se person?…these are technical terms. These are important questions one must answer. I think its also important tidbit of info to know about other people. So you can prepare it for them the way they like it…People like that. Knowing how they prefer things, without having to ask. It says, I pay attention and I like you enough to remember how you take your coffee, eggs, or bacon. Its nice. Also, it might say something about the individual person. I am not sure what yet, but I am sure cream only, scrambled, and crispy bacon says something to the inner workings of a person. I’ll get back with ya once I figure it out! 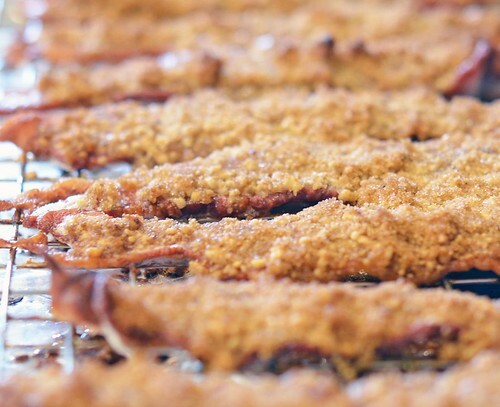 I prefer my bacon crispy…very very crispy and with a side of maple syrup to dip it in. Weird? I think not! This bacon recipe contains the same flavor combo. Salty and sweet. Anything better? 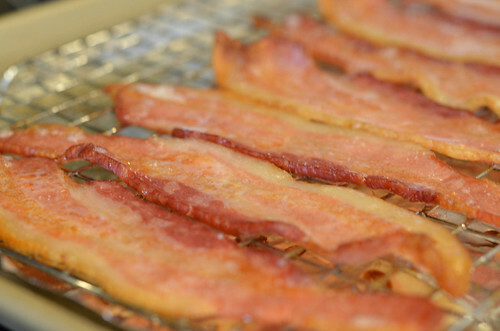 I have done the brushing of bacon with maple syrup – delicious by the way, but as I was flipping through the channels the other day, I caught a glimpse of Alton Brown scattering brown sugar over bacon … and I thought – genius!!! Plus some brown sugar and a ground up nut of your choice…I had walnuts, but pecans or almonds would do as well. It tastes as good as it looks…trust me. I know. So what do you do with this praline like bacon? Well, its great all by itself. Its great along side a stack of pancakes or waffles. Or eggs. But guess what? 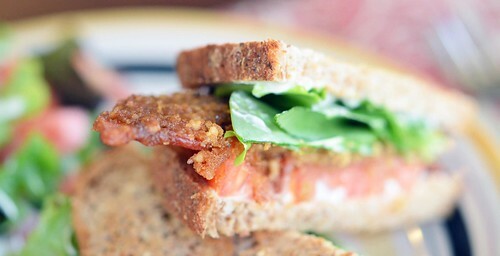 Its great as the B in a BLT. Yep. It was healthy…I had a salad! 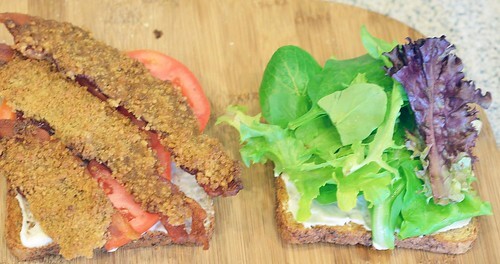 Serves 4 to 6 – however many people 1lb of bacon is supposed to serve. Place in oven and bake for about 15 to 20 minutes – just until its about done (this time will alter depending on thickness of bacon). 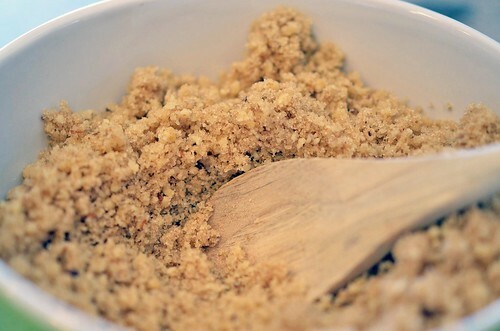 While this is baking, mix together ground nuts and brown sugar. 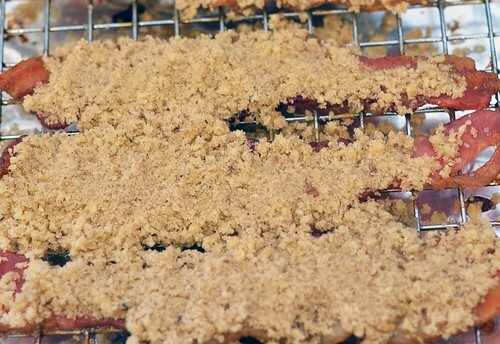 Remove bacon from oven (keep oven on) and pile the brown sugar/nut mixture onto bacon slices. About 2 to 4 Tablespoons per slice. Lightly pat down. 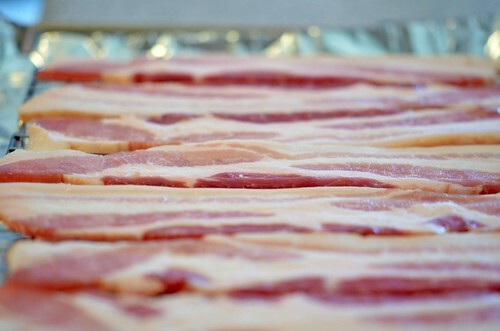 Return bacon to oven and continue baking for 10 to 12 minutes or until the brown sugar has melted. Remove from oven and let rest for 5 to 10 minutes before eating.